Please copy and paste ' [[Category:Rasboras]] ' into the end of your article to include it in this category. Rasboras belong to the family Cyprinidae. They are small minnow-like shoaling fish, an excellent alternative for the community aquarium and an alternative to the Tetra. Fish from genera such as Boraras, Microrasbora, Rasbora and Trigonostigma are commonly referred to as Rasboras. 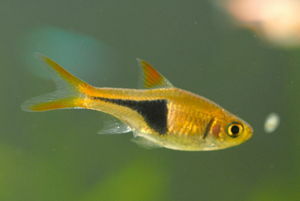 Currently the genus Rasbora remains the largest one, containing around 70 species, which can be found in Southeast Asia and Africa. This page was last edited on 27 August 2015, at 09:52.